Singer Katy Perry dazzled at Sunday's Super Bowl halftime show in a dizzying performance that featured dancing land sharks, a prowling metallic lion and a levitating star that shot sparkles into the Arizona night. 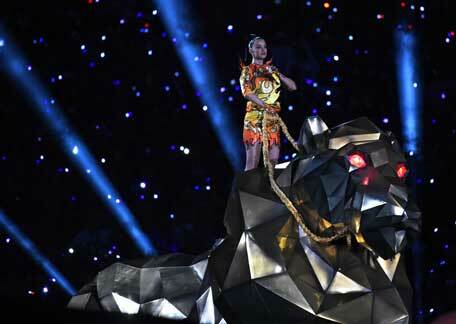 Perry stalked into the University of Phoenix Stadium field in Glendale, Arizona riding the huge, fiery-eyed lion as she sang her megahit 'Roar' while wearing a flame-festooned dress. The 30-year-old star performed a brief duet with rock legend Lenny Kravitz, and the pair sung 'I Kissed A Girl,' one of Perry's first big hits in 2008, during a brief-but-raunchy performance. During the show, Perry wore an array of flamboyant outfits, including this fire-themed dress and this beach one. 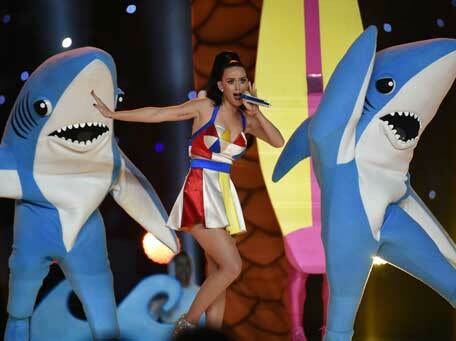 The Super Bowl's halftime show has become a must-see event in the middle of the NFL's championship extravaganza. Halftime performances generate massive ratings and, sometimes, unexpected controversy such as when Janet Jackson inadvertently suffered a 'wardrobe malfunction' that saw much of her breast exposed in 2004, or Prince's 2007 show that featured a strangely shaped guitar that cast a phallus-shaped shadow. Perry's 12.5-minute performance did not appear to generate any such controversy and the reaction on social media appeared overwhelmingly positive, with many users praising her live singing, her dancers and her three quick costume changes. Missy Elliott was the star guest of the performance, making a foggy entrance to sing hits including 'Get Ur Freak On', and 'Work It.' The newly svelte rap diva's high-energy number 'Lose Control' was a crowd pleaser. 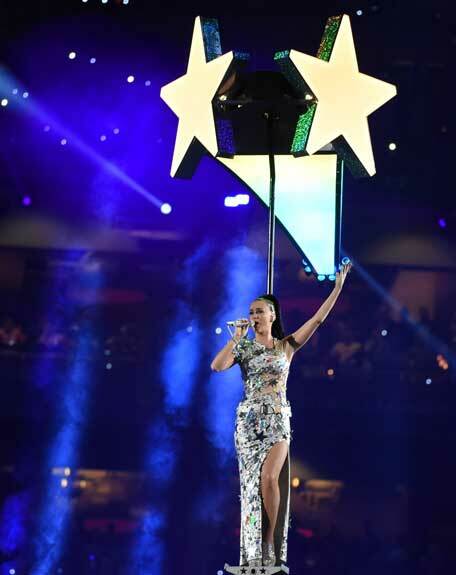 She climbed onto a star-shaped platform and elevated above the football field, cruising around the stadium as fireworks burst around her, to enthusiastic cheers and applause from the crowd.